32Red Casino Review (2019) | PayPal ✔ | Instant Payouts ✔ | See It All Here! The Casino Professor feasts his eyes on one of the biggest sites in the online gaming world, with his 32Red Casino review ready for his readers. Strap yourself in for a detailed overview, and if you decide to give them a try then please let the Prof know what you think by adding to our user 32Red Casino reviews below. 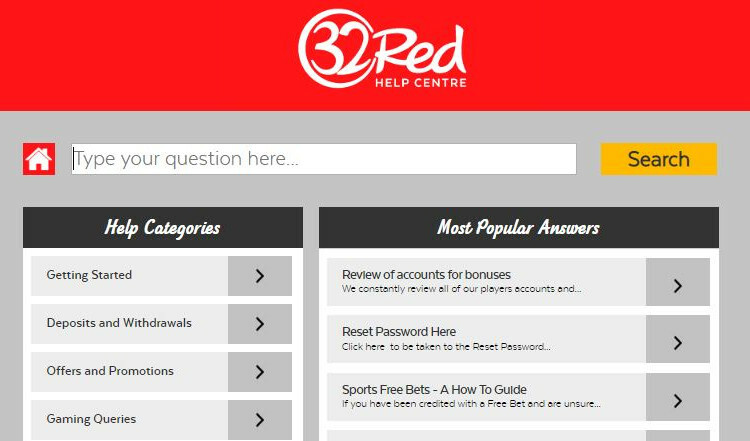 32Red launched in 2002 and is today owned by Kindred Group – the same people who lay claim to Unibet. They are a stalwart of the iGaming world with plenty of experience behind them and some quality features. Despite a few irritants, the Professor was pretty pleased with what he saw. Once that’s all done and dusted, we move on to 32Red Casino’s first deposit bonus of 320% up to £160. N/A – No specific 32Red Casino bonus code is required. Both offers will be granted automatically. Unfortunately, 32Red do not offer any free spins as a promotion for their new players. Bonus must be used in 7 days. If you have claimed a bonus at Roxy Palace then you cannot get this 32Red Casino bonus. The Professor wasn’t exactly delighted with that news, so he thought it was something for you to certainly consider. 32Red Casino’s general terms and conditions also apply. In addition to their welcome bonus, there are a number of other bonuses for players. You can find exactly what’s on offer within 32Red Casino’s dedicated Promotions page, with football tickets at a possibility. One such other example is 32Red Casino’s Red Ruby Rewards loyalty scheme. In this program, as you play, you earn rubies (32Red’s name for loyalty points), which accumulate over time and allow you to cash them in for certain rewards – specifically, casino chips. Like many loyalty programs, the scheme is based upon moving through different tiers, culminating in the Club Rouge level. In the Club Rouge level, players will get a whole host of additional benefits and personalised promotions. For example, players will get a Birthday Treat of 5,000 loyalty points which can instantly be redeemed as £50 in cash. Players will also be invited to monthly events and promotions, and each month 32Red will award two lucky members with bottles of champagne, Cuban cigars, or the finest of chocolates. A casino the size of 32Red is sound in the knowledge that they need to accommodate to all of their players’ needs, including offering a decent number of payment options. They have a minimum deposit of £10 (or equivalent). In terms of currencies, it relates to their available regions: £ (GBP), $ (USD), € (EUR), $ (CAD), $ (AUD), kr (NOK), (RUB), Fr (CHF), kr (SEK) and ¥ (JPY). They have a minimum withdrawal amount of £10 (or equivalent). When it comes to the slots available at 32Red, there is a familiar theme. This is one of the many casinos powered by Microgaming only, meaning you will only find slot games from this provider here. While there’s no doubting their popularity, the Professor can’t help but be slightly disappointed. He’s all for paying homage, but a little variation wouldn’t hurt! However, there are some upsides to this too. 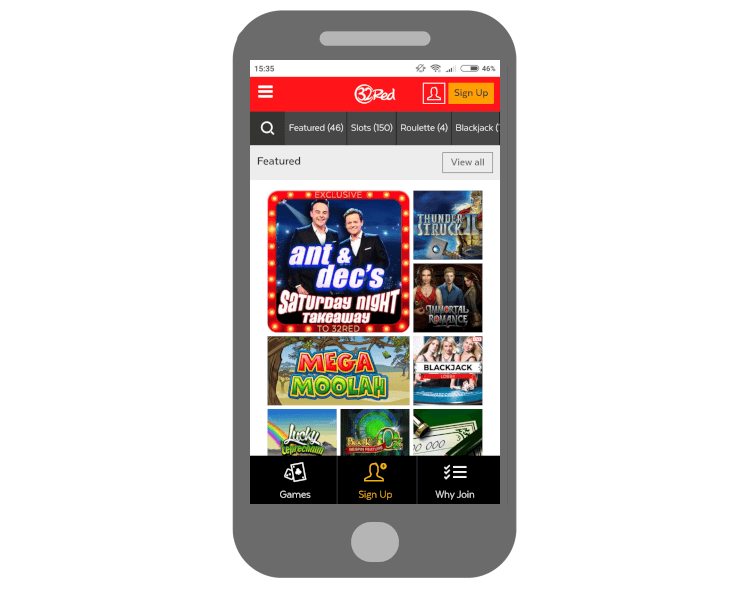 First, they’ve managed to nab some exclusive titles all for their own – including the popular British titles Ant & Dec’s Saturday Night Takeaway and I’m a Celebrity…Original slots. 32Red Casino’s slots are also certified as fair by eCOGRA. Checks are carried out once a month to ensure the playing field is level, and these have been carried out for a number of years. Also, Microgaming have hundreds of titles available so you won’t be running out of options – including their Mega Moolah jackpot hit. On the live casino side of things, 32Red have chosen Evolution Gaming as their provider of choice. There isn’t a massive number of tables where you can figuratively sit down at, but the main roulette, blackjack, baccarat and card poker games are catered for. To throw in something a bit different, you can play Dream Catcher at 32Red live casino too. Outside of casino, 32Red offers a sportsbook so you can wager on your favourite teams and/or horses, online poker for those who want to try and bluff their buddies, and bingo so you can try and get your numbers all in order. 32Red is mobile-friendly, which means players can enjoy some of their favourite games whilst they’re on the move. In fact, the experience you’ll have when out and about closely matches that of desktop – so remote gamblers no longer miss out on the good stuff. It should be said that all top casino sites have this capability these days, but a casino as big and as well executed as 32Red also has the ability to bring you something else. What we’re referring to is 32Red Casino’s mobile app for both Apple and Android. Download either option for free to make it a native experience. However, the Professor notes no real advantage of using this software – so if you’re looking for any in-app exclusive casino bonuses then don’t waste your time. 32Red Casino is an incredibly large and reputable website. Sure, they have a few complaints from time-to-time (which casino doesn’t? ), but there are very few issues to do with credibility. If there was, the Casino Professor doubts they’d have become a Kindred Group brand. They’ve earned themselves a shining reputation, in part thanks to the length of time for which they have been operating and the experience they’ve gained. Email – with dedicated sections. Okay, while we don’t think you’ll be using that last option, the first three are enough to go by. For non-UK players, 32Red Casino’s support team is available in a variety of languages just in case. Of course, 32Red must have gaming licenses to operate – and they’ve got two! One is from a highly reputable licensing body: the UK Gambling Commission. The other has British connections but mostly serves the rest of Europe: the Gibraltar Remote Gambling license. This replaces the usual Malta Gaming Authority certificate but is no less genuine. Again, the fact that 32Red Casino publishes regular game audits from the independent and third-party organisation eCOGRA speaks volumes about their transparency. 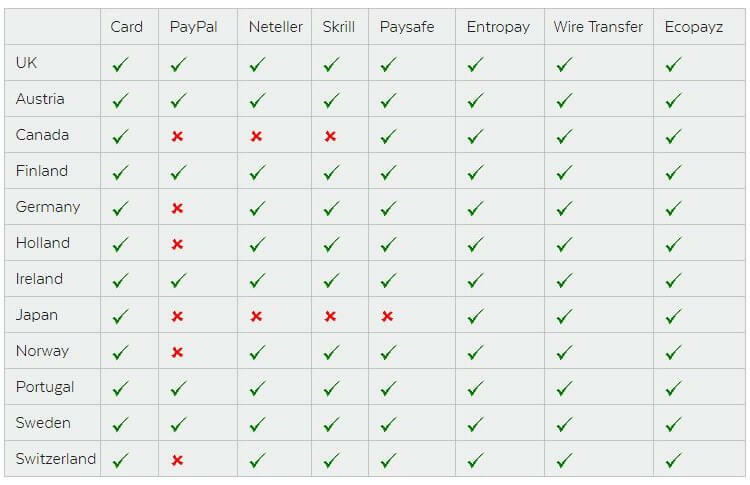 Also, being able to make casino deposits via PayPal adds another layer of transaction security that few others have. As usual, there are a lot of territories and regions that cannot access 32Red Casino’s entertainment. They are: Afghanistan, Albani, Algeria, Angola, Australia, Austria, Bahamas, Belgium, Botswana, Bulgaria, China, Christmas Island, Cocos (Keeling) Islands, Colombia, Costa Rica, Czech Republic, Denmark, Ecuador, Egypt, Eritrea, Estonia, Ethiopia, Faroe Islands, France and French Territories, Ghana, Greece, Greenland, Guadeloupe, Guam, Guinea-Bissau, Haiti,, Hong Kong, Hungary, Iran, Iraq, Jordan, Kuwait, Lybia, Martinique, Mexico, Myanmar/Burma, North Korea, Pakistan, Philippines, Portugal, Reunion, Romania, Russia, Saint Martin, Serbia, Singapore, Slovenia, Somalia, South Africa, South Sudan, Spain, Sri Lanka, Sudan, Syria, Trinidad & Tobago, Tunisia, Turkey, Turkmenistan, USA, US Minor Outlying Areas, US Virgin Islands, Uzbekistan, Venezuela, Yemen, and Zimbabwe. Although I admit I was sceptical at first, 32Red Casino have proved themselves to be a real force to be reckoned with. You can use PayPal to make deposits – and it’s actually one of the few accepted to trigger bonuses – with general withdrawal times being reasonable too. Overall, the thing that we think will make you want to play at 32Red is that they are simply a great all-round casino with years of experience – no corners have been cut. Agree? Disagree? Don’t hesitate to let me know your own thoughts in the comments below!